This article can be found on Bloomberg Markets website. Currency investors risk leaving money on the table if they don’t submit claims on a $2.1 billion pot of settlement money paid by banks accused of rigging foreign-exchange rates. That’s the message from Battea FX Group LLC, which is competing in the business of advising clients on how to get their share of the payouts. 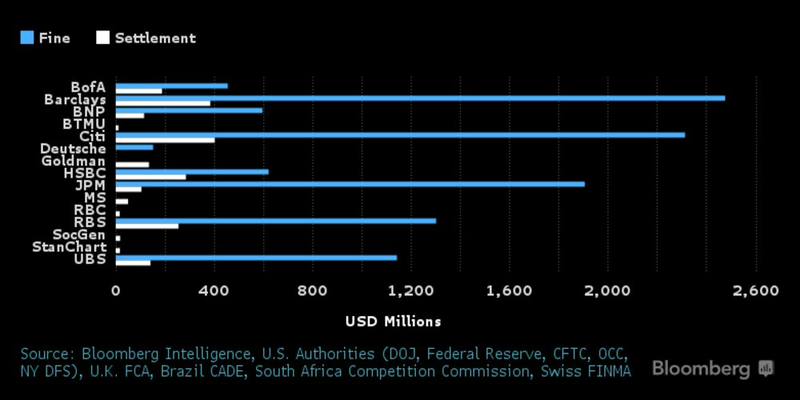 Its seven former FX traders and executives are helping firms recover funds from class actions claiming that some of the world’s biggest banks conspired to manipulate the $5.1 trillion-a-day currency market. Fourteen banks have settled, including Bank of America Corp., Barclays Plc, Citigroup Inc., HSBC Holdings Plc and Royal Bank of Scotland Group Plc. Here’s how it works: Companies that traded currencies with the dealers from 2003 to 2015, including hedge funds, asset managers, pension funds, corporations and even other banks, hire Battea or one of its competitors. The advisory firm crunches data from deals in spot, forwards, options, swaps and futures markets, seeking to recover as much money as possible via a court-appointed claims administrator, and it gets a contingency fee based on the amount awarded. “Locating data for a 12-year period makes it a tall order,” said Peter Kilbinger Hansen, chairman of Battea Class Action Services LLC, which owns Battea FX Group and specializes in recovering funds from securities class actions. “It’s an undertaking — we are very much out in the front lines working with clients around the world to get their data organized,” Hansen said in an interview in his office in Stamford, Connecticut. In currencies, the task is complicated because claimants have to identify a complex web of potentially millions of transactions, spanning multiple platforms around the world. Firms can process claims without any outside help. But Battea says it aims to submit “bulletproof” applications using its knowhow in FX markets, data analysis and legal procedures, according to Hansen. James Donahue, a vice president at Battea FX Group, formerly worked in currencies at Bank of America Merrill Lynch, one of the banks that settled. The currency scandal roiled the world’s biggest financial market and sparked a multi-year effort by central bankers and industry participants to stamp out misconduct, including the creation of the FX Global Code of conduct. For investors seeking a share of the settlement funds being held by an administrator, the decision to submit claims isn’t as straightforward as it might seem. In a market where money managers do most of their currency transactions with a handful of banks, there’s still a reticence to pursue settlement funds for fear of damaging relationships. Battea, which has more than 700 clients in financial markets, points out to prospective customers that the claims process is confidential and won’t embarrass their counterparties. The Battea FX team, assembled over a year ago, has traveled to New York, Boston, London and Dublin to drum up business. They’re headed back to Europe, and to Asia and Australia in the next two months.